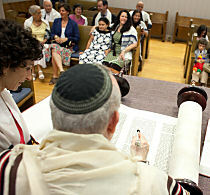 The roughly 500 households who are members of Beth Am come from a wide range of Jewish backgrounds and traditions. All are welcome. Jews with non-Jewish partners find Beth Am accepting and nurturing. Families with little formal Jewish education or experiences enjoy comfortable opportunities to enhance their lives through our education programs and celebrations. Those who are more traditional in practice or outlook enjoy the informal atmosphere of our engaging Conservative Shabbat morning and holiday services. Many members live in the city, and many share a strong commitment to addressing urban challenges, regardless of where they live.